I can remember seeing pictures of an area in China that had these really strange mountainous outcrops that seemed to appear out of the ground at regular intervals, like up-turned cups, stretching off in to the distance. In the foreground, a worker in the field with a conical hat, harvesting rice no doubt. Manda had also seen pictures of this area, Guilin, and wanted to go there, but we had not planned to go to China this time. When we started looking through the Lonely Planet for Vietnam, we spotted a picture similar to this - just transplant the worker in the field with a junk boat on the water and you have Halong Bay. And this was part of our reason for making the trip up-country from Saigon - to go out on a boat in the beautiful Halong Bay. 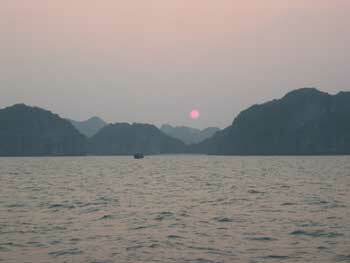 The bus collected us at 7:45am and made its way out of hectic Hanoi for the calmer surrounds of Halong. Well, it should be calmer, but at our half-way point on the 3-hour journey there, we stopped off for a comfort break only to be followed by another dozen or so tour buses. It was one of those meeting points where the tour guides all get together for a quick bowl of noodles and the locals fleece the visiting tourists for all they can, particularly over-priced water and cans of drink. 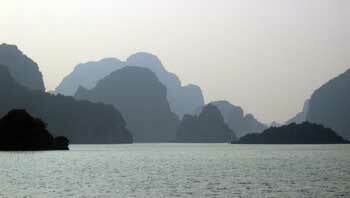 There were so many people descending on this place, and we knew they were all heading to Halong Bay. So much for calm. Also at this tourist stop was an industrious group of girls busily embroidering while everyone watched, and naturally the embroidered clothes were for sale there too. In that case, though, the proceeds from sales went towards children who were still suffering the effects of agent orange - a nasty poison that was dusted over swathes of Vietnamese land to kill plant cover, thus preventing enemies of the US from hiding. Years later, children are born with deformities passed on from their parents, so at least the profits would go to some good. 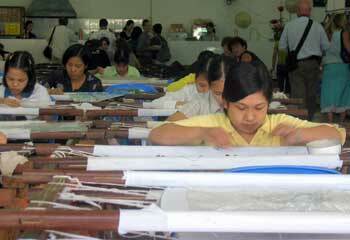 They'll stitch you up a treat here - with embroidery, I hasten to add. We spotted our new Malaysian friends from yesterday (Li Ping, Siu Ling and Ching Yee), just as we thought we would - they had mentioned that they were going to Halong Bay on another tour, but we knew that, tour company aside, we'd all end up in the same place! We said our goodbyes for a second time and wondered if we'd see them again at the harbour. As with yesterday, many different people would have paid many different prices for exactly the same trip. Once they reached the harbour, the different guides would sort everyone, collect passports for those people staying on board a boat overnight and try to get everyone on the right boats - there were hundreds in the harbour - and all the passports back to their rightful owners. It looked like absolute chaos. That's because it was. There were 5 people on our boat who were asked to transfer to the one next to us. They had already settled down at a table and found homes for their luggage when they learned this, and the grumbles soon begun - because they'd just been transferred off that boat to ours! The people around us kept their fingers crossed that they would once again see their passports, including Nic, a girl sat opposite us who was taking a holiday in Vietnam on the way home to London after two and a half years in Japan. We talked about her travels. She, too, had done the year out in Australia then returned home to parents saying things like "Well, now you've got that travel bug out of your system, time to settle down with a sensible job ...". She was hoping to work in Spain next teaching English and learning Spanish with a view to travelling around South America in the future. I think the travel bug had a hold on her now, no matter what mum thought! After about an hour waiting on the boat and watching hundreds more tourists being sorted on to the right boats, we finally made our way out of the harbour. Lunch was also served (we'd been taunted by the sights from the boat next to us of plates of chips, Vietnamese food and bottles of red wine for too long). It had been a long wait and some of it was OK, but the chips were stone cold, and there wasn't really all that much to go around. I hadn't expected gourmet food, though. One of the more expensive tours (a bit too expensive at $70 per ticket) that had been recommended to us was reputed to have excellent cuisine. I thought of this as I crammed another fork-load of cold, saggy chips into my mouth. But then I reminded myself why we were here - it was for the sights, not the food, and we would all get the same on that front no matter what we paid. 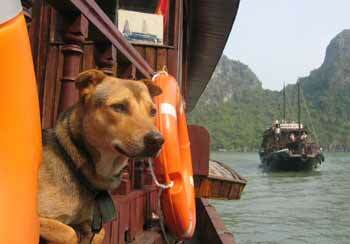 The skipper had an uncanny sense of direction - he just followed his nose. After lunch, I made my way out on to the bow of the boat to be confronted with the first of the ranges of karsts (as these mountainous outcrops are called). Immediately the camcorder came out, and Manda started snapping away with her camera. Every time we went past one set of interesting-looking peaks, another set would present itself in the distance. Because it was a hazy day and the sun was hidden by a uniform layer of cloud, the ranges appeared as various shades of grey with the darkest in the foreground and lighter shades in the distance. The different shades of the karsts, Halong Bay. We made a stop at a set of caves, along with boat-loads of other people. These were the Thien Cung and Dau Go cave systems. The first one was well worth a look around, and was nicely lit in various lurid colours. As we walked around with our group I came out with the insightful comment: "This place is so cavernous!" I meant that it was large, of course, but was essentially saying "Wow, this cave is so cave-like." Genius. We took a walk out of the first cave and over to the second but, despite the lack of sun, it was turning into a hot day and most of us were starting to sag. We got to the entrance of the second cave, noticed it wasn't lit up all fancily and decided not to bother walking around it - too hot! 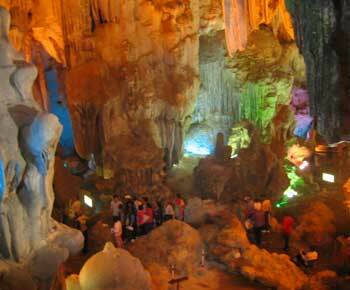 Tourists make their way around inside the brightly-lit Thien Cung Cave. After the cave stop, we continued on a little before stopping at a floating house with a fish-farm. There were quite a few of these floating houses here and they looked just like a typical British garden shed, albeit with a bit of decking around it and a view to die for. On the top of the wooden shed-like structure, a TV aerial; inside the shed, a decent TV and probably a VCD player/karaoke machine. The fish farm here had various sea-life held captive in its nets, including some shark-like fish and even some large turtles. I am not sure of the legality of catching the turtles, but out here who could stop these people? What do conservation laws mean to people living off the land (or sea) like this? Nothing at all. All I could do was not offer to buy one for the chefs on the boat to cook up for me, because that was half the reason for our stop. Nobody else partook of mini-shark or turtle and soon we were on our way. We carried on cruising along through the karsts until the sun dipped down behind them and we made our way to Cat Ba island. We chose to stay on the island overnight rather than on the boat. The reason for this was simple: the brochures suggested that we bring along various items including insect repellent. Now, going from past experience of Vietnamese leaflets, they don't tell you about anything bad, you normally have to find that out for yourself. So, I reasoned, if the tour companies are making a point of warning about insects then they must be ravenous out here. Therefore we opted to stay in an air-con room on this island rather than stay on the boat and get eaten alive by mosquitoes. It was a cool night and I'd not seen any evidence of mosquitoes all day. I wondered whether we'd made the right decision as we headed for our hotel.